Christopher Alexander (Rocky River) had performed well on the national stage previously. The Rocky River senior had jumped 50-6.25 outdoors to place 3rd last spring. Alexander came into nationals at NC#2 and US#6. He knew he'd need a jump over 50 feet to be in contention for a national title. In the national field it's tough to even make the finals. You have to have a big day early in the competition. With 38 of the best jumpers in the country it took 48-5.5 to place top 8 to make the final. Alexander was an All-American contender in the Long Jump, but didn't make the final on Saturday. He said "Coming in I was looking for a new PR. After ending last year with a 50-6 I wanted to exceed that in order to become an All-American again"
On his first jump Alexander struck his best jump of the year landing a new overall PR of 50-10. His biggest competition Justin Forde (CT) would also come out with a big jump of 51-3 and two others in Jadan Hanson (NY) and Sean Dixon-Bodie (CT) clearing 50 feet as well. In the finals only one athlete would set a new best, and the top 5 would remain in the same order. Alexander landed a 49-9.75 on his third jump, 47-10 on his fifth jump and 49-4.50 on his final attempt. Though 50-10 is a new PR Alexander knows there is more left in the tank looking back at his jump. "I definitely could work on my first phase and work on my landing. It may help with working up to 52 feet." His jump wasn't just a new PR. The mark made him the fourth North Carolina athlete ever to exceed 50 feet indoors, and the first since 2007! It moves him up to NC#2 All-Time Indoors as well as US#22 All-Time Indoors. 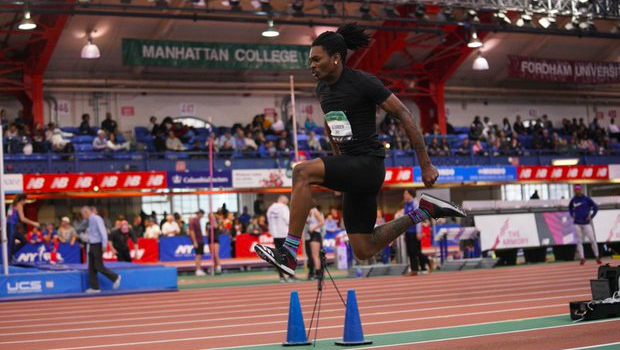 Alexander certainly benefitted from seeing a strong jump field throughout the indoor season. He'd see national caliber jumper Eric Haddock (Southeast Raleigh) multiple times in the season including the 4A state meet. Haddock ends his indoor season at NC#6 All-Time Indoors at 49-10.25. Outdoors only 9 North Carolina athletes have exceed Alexander's 50-10. We'll see what kind of damage Alexander can do on the record books this spring. Alexander is set to attend NC State in the fall.